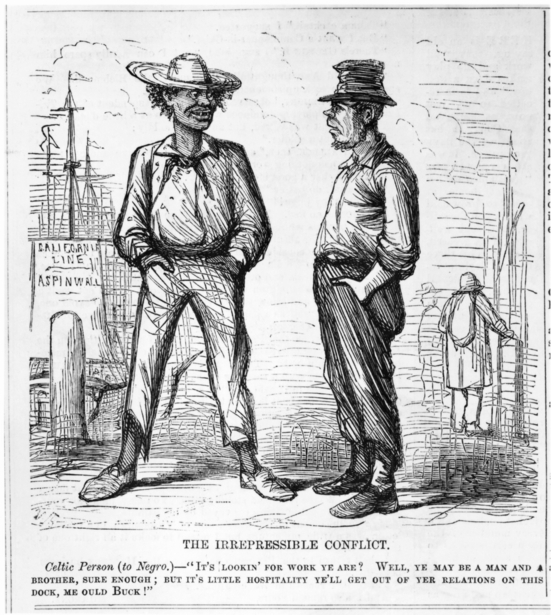 In this cartoon from the weekly satirical magazine Vanity Fair, an Irish longshoreman tells a black worker seeking employment on New York's waterfront: "Well, ye may be and man and a brother, sure enough; but it's little hospitality ye'll get out of yer relations on this dock, me ould buck!" The sharp competition for unskilled jobs between Irish immigrants and free African Americans contributed to the New York draft riot of 1863, in which more than 100 New Yorkers were killed and many African Americans were attacked and murdered by the mostly Irish rioters. Source | "The Irrepressible Conflict," Vanity Fair, August 2, 1862; from Who Built America? Working People and the Nation's Economy, Politics, Culture, and Society, Vol 1 (New York: Worth Publishers, 2000), 563. Cite This document | Unknown, “"The Irrepressible Conflict",” HERB: Resources for Teachers, accessed April 23, 2019, https://herb.ashp.cuny.edu/items/show/1629.